The Technological Future The new law course, made possible by a grant from the Silicon Valley Community Association (funded by Cisco), was taught by (from far right) Visiting Associate Professor Nicolas Vermeys, Chancellor Professor of Law and Director of the CLCT Fred Lederer, and Visiting Assistant Professor Iria Giuffrida. Can a music score created by artificial intelligence (AI) be copyrighted–in the U.S., Canada, or the European Union? Will there be civil or criminal jurisdiction for an act based in part on data transmitted via the Internet-of-Things (IoT)? These questions are just a few of the issues being discussed this semester in a new course, “Artificial Intelligence, Emerging Technologies, and Their Effects on the Legal Landscape,” that is helping the school prepare students for today and tomorrow. The school’s pioneering AI course was made possible by a grant from the Silicon Valley Community Association (funded by Cisco) to the Center for Legal and Court Technology (CLCT). That grant enabled CLCT to add to its staff Visiting Assistant Professor of Law Iria Giuffrida, who joined the faculty from the U.K., where she specializes in EU Law and international commercial matters, and, for 2017-18, Visiting Associate Professor Nicolas Vermeys, a law faculty member from the University of Montreal. Professor Giuffrida, a William & Mary Drapers’ Scholar from the U.K., earned her LL.M. at William & Mary in 2002 and then became the only LL.M. student to remain as a visiting assistant professor of law before she returned to the U.K. for her Ph.D. Professor Vermeys, a cybersecurity, privacy, and e-commerce expert, and Associate Director of Canada’s Cyberjustice Laboratory, holds a Ph.D. in cybersecurity and is a key advisor to CLCT’s rapidly expanding AI effort. CLCT has just completed an international AI law student paper competition and announced the winners in April. In addition, the two professors along with Professor Fred Lederer and CLCT’s staff are planning an AI working conference at the Law School to be held in Fall 2018 and considering how best to take advantage of collaboration offers from European universities. Molly Lovell J.D. ’18 said the course made her think about “how AI is going to impact legal practice both in the U.S. and abroad” and gave her an appreciation that legal practice “will look very different in twenty years than it does today” as a result. She said the prospect of such vast change may seem daunting from the practitioner’s point of view but the societal gain will be great. “We’re going into an era where people who ordinarily wouldn’t have access to legal knowledge will have it,” she said. The course helped Lovell feel better prepared for the future. “I want to be one of those attorneys who embraces new technology and this class has taught me to do that,” she said. The AI course isn’t the only Law School course dealing with the technological legal future. In addition to relevant content in its other courses, the Law School teaches eDiscovery, Cybersecurity, and Technology-Augmented Trial Advocacy. The Law School and Mason School of Business recently co-hosted a cybersecurity conference (“Cyber Intrusion, A Conference of Experts") in which Professor Vermeys participated. The Center for Legal and Court Technology is an entrepreneurial public service initiative of William & Mary Law School and the National Center for State Courts, dedicated to advancing the efficient use of technology in the administration of justice. Learn more. 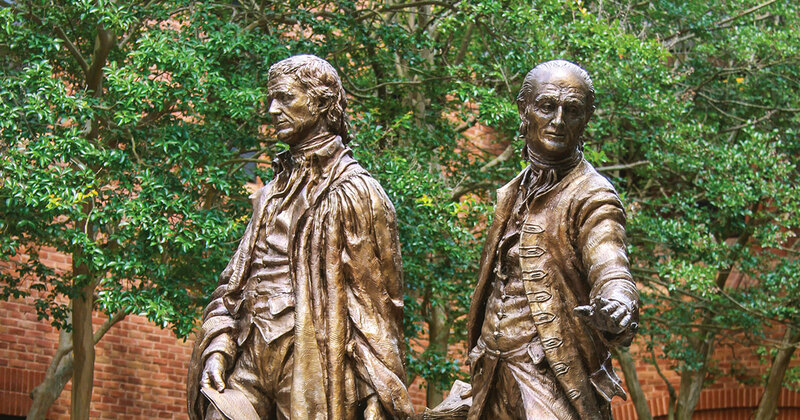 Thomas Jefferson founded William & Mary Law School in 1779 to train leaders for the new nation. Now in its third century, America’s oldest law school continues its historic mission of educating citizen lawyers who are prepared both to lead and to serve.